Hi, I’m Vanessa from Punkin Patterns. 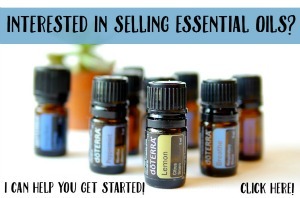 I’m thrilled to be here today on Everything Etsy to share with you this great tutorial. 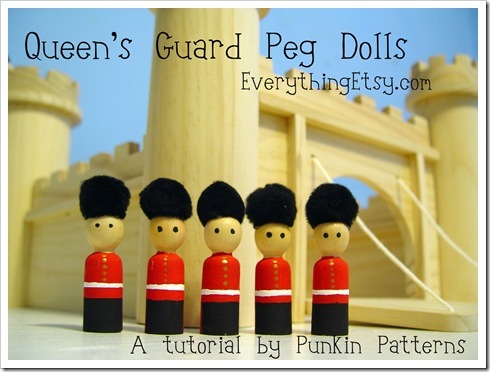 What child wouldn’t love to have their castle guarded by the Queen’s Guard? 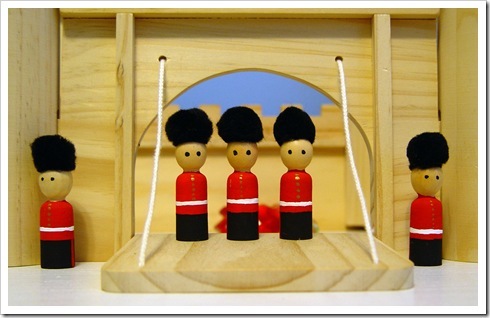 With their bright red coats, brass buttons and large bearskin hats these foot soldiers guard the castle from any enemy. 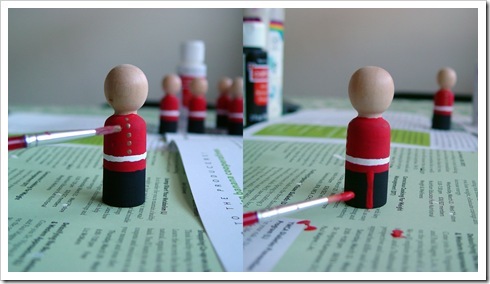 These soldiers are very easy to make. 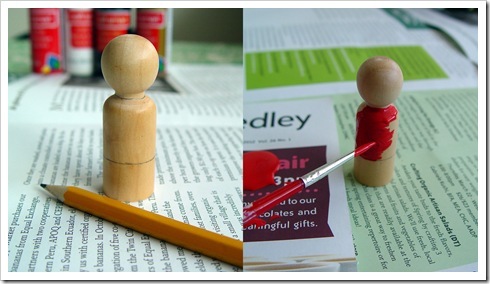 You’ll need some wooden peg dolls you can get at any craft store, acrylic paint in (red, black, white and gold), small brushes, and 1″ black pom poms. 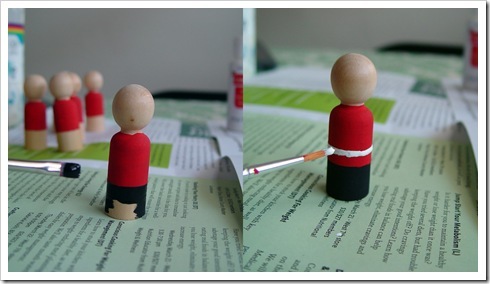 Start by marking the doll with a pencil to mark the bottom of the red coat. Mark it about 3/4″ from the bottom or so. Mark a neck line also. Paint this section red. You may need a few coats (no pun intended) to get the red coat to look nice. Paint the bottom of the soldier black (the pants), then add a white belt a little up from the bottom of the red coat. Add a row of brass (or gold) buttons down the center front of the coat. Then add thin red lines down each of the sides of the pants. 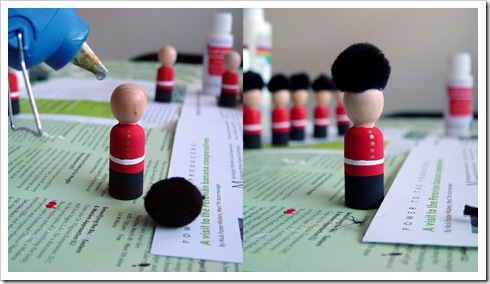 Glue a 1″ black pom pom on top of the peg dolls’ head. Lastly, add some facial features if you like. 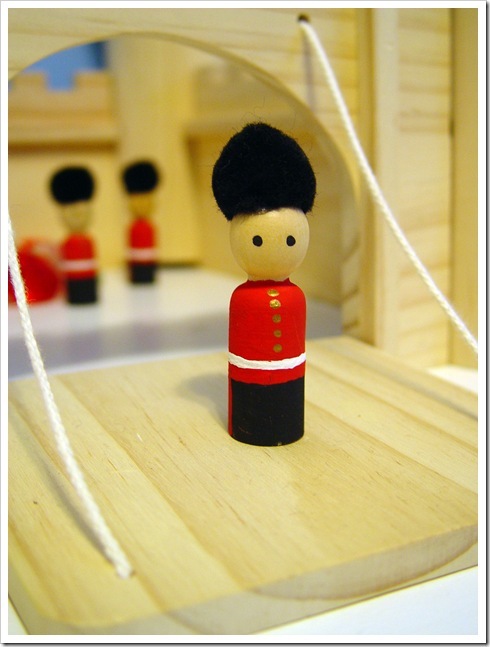 Now you have your soldiers ready to guard the queen, castle or treasure! This lovely tutorial was created by Vanessa from Punkin’ Patterns! 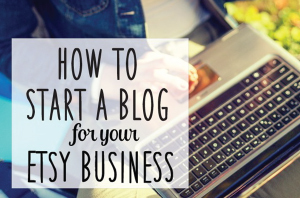 If you would like to submit a tutorial, please email me at Kim@EverythingEtsy.com. I’m sure you know someone that would love some of these guards! I love this ! I love the royals ! May I ask, where did you find that wooden castle? I’ve made several princess peg dolls for my niece and that would go perfectly!